A YEAR OF JUBILEE REVIEWS: Apologia: Who is my Neighbor? I was thrilled when I heard about Apologia's series What We Believe. I had heard about the fine job Apologia has done in providing stellar science curriculum to the home school community but I hadn't heard of them being involved in other topics as well. This is one of those companies whose name has been synonymous with defending the Christian faith. 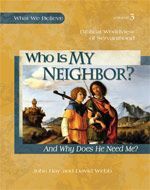 Who is my Neighbor is the 3rd in the series, the 1st we have used. It doesn't hinder you at all if you jump into book 3 without doing 1 or 2 first. I haven't felt we have missed anything simply because they are different topics of interest. 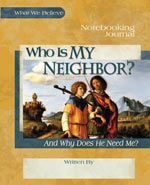 Selling for $39 Who is My Neighbor is a daily study in helping students see why they should be salt and light to the world, but also gives them tools for doing that in their own lives. Hard bound, durable book that will last through all of your children. Geared for children aged 6-14 it is easy to go a few ages on either side of that as well. I used it with my younger children and though they may not get every bit of value out of it, they still are able to learn about people being salt and light in the world. The stories are of interest to them and they are hearing scripture that is planting seeds in their young hearts. I had my 13 year old using the Who is My Neighbor Notebooking Journal which sells for $24 and goes along perfectly with the study. Each day the student is given suggested pages to complete and the corresponding reading pages in the manual. No guessing how far you need to go to complete the suggested days lessons. Looking at the manual alone it is a bit difficult to see where to stop. There aren't clear beginning and ending points. The guideline in the journal was our road map. Easily done within half an hours time, I would actually read the manual out-loud so the young ones could hear. It is written at a 5th grade level so if you were using it with just one child they could do the entire thing on their own. My 13 year old would begin his journal righting after that. I would ask the discussion questions and open them up to the 10 and 7 year old as well, sometimes giving them suggestions on answers that they could consider. This study could easily blend in to being a morning devotional type of course. I feel that it lends itself nicely to larger families and an array of ages. I personally enjoyed the stories of people in foreign lands helping one another in the name of Christ. 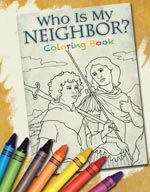 Something that made it more enjoyable for my little ones was the coloring book you can purchase for $8, Who is My Neighbor Coloring Book. As my 7 year old listened to my reading she could color the page that went along with the lesson for the day, giving her something to keep her attention while she listened to the story of the day. I am considering getting another coloring book for the 4 year old to start engaging him in as well. Great review! Welcome to the CREW!! Now I am wishing I had reviewed this... :) Glad you guys are enjoying this! Great review! We really like this Apologia series. Stopping by from the Crew and following your blog now!